Every year there is uncertainty among Muslims around the world about the beginning and the ending of the fasting month of Ramadan. 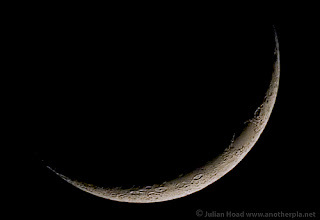 A new Muslim month starts with the first sighting of a crescent Moon. The problem is that most Islamic scholars insist on actually seeing the Moon rather than use calculations. As a result there are official Moon sighting committees in Muslim countries and more informal groups in the US, the UK, and in several European countries. In an age when we can calculate positions of the Sun and the Moon for thousands of years and have actually landed humans on the Moon, it is amusing to see a group of unsure people gazing up at the sky looking for the Moon determine a calendar. Sure some defend this practice using doctrinal arguments, but ultimately it says a lot about the Muslim attitude towards science and nature. I remember the Moon sighting committee in Pakistan. The committee was paid by the government to search for the crescent Moon each month. Ignored for 11 months, they would come into spotlight for the start of each Ramadan. They would set up telescopes on top of a tall building in downtown Karachi and search for the Moon. They searched even on days when it was astronomically impossible to see the Moon. I guess they could not rule out the Moon simply speeding up to show up a day earlier than what its usual path would predict. Some Muslim groups, to their credit, have started to incorporate calculations for their lunar calendars. For example, the Islamic Society of North America (ISNA) has issued a calendar for the next ten years (also see here and here for calendar efforts). However, they have also come under intense attack for this decision and most Muslim groups in the US have decided not to follow them. As a result, Ramadan this year started on two different days in the US - September 1st for ISNA and September 2nd for the Islamic Circle of North America (ICNA) - that follows the rule of actual Moon sighting. Local mosques and Islamic centers in the US usually follow one of these two groups. And if you think this problem is going to be resolved soon – think again. Perhaps the best example of lunacy comes from the Organization of the Islamic Conference (OIC) - an organization of 57 Muslim countries. They want to spend $10 million to build and launch a satellite to keep track of those pesky phases of the Moon. You might think (or wish) that this was from the Onion or that I was simply making this up. But alas - there really are plans for such a satellite. Why can’t they simply Google for the phases of the Moon for free and invest those millions in the much needed basic science research. An acceptance of a calculation-based calendar by the Muslim world will be an important step for them. It will show a willingness to reinterpret and adapt doctrines for modern times and perhaps more importantly, it will show a trust in our understanding of nature as revealed by science. I hope the resolution happens before the establishment of a permanent colony on the Moon – it will be mighty hard to look for these phases from the lunar surface. I imagine it would be an even greater nightmare to pray towards Mecca from the surface of the Moon. The Moon is tidally locked with the Earth - i.e. we always see the same side of the Moon. So if you are there then Earth will be clearly visible in the sky (as in some Apollo pictures). However, if you are on the side that does not face the Earth (dubbed as the dark side of the Moon - even though its not dark from sunlight. A better name is Far-side of the Moon,), then one may have to come up with some other prayer orientation. This is the reason why Muslims need to adapt to modern age rather than quibble about out-dated technicalities. While I understand what you are saying about the same side of the moon facing Earth, depending on the time of the day Mecca will be in 5 different directions at each prayer-time because of the Earth spinning on it's axis. I don't know enough about it but wouldn't Mecca be directly overhead sometimes? depending on the time of the day Mecca will be in 5 different directions at each prayer-time because of the Earth spinning on it's axis. Ah..good point. But over all the Earth would still appear quite small from the Moon - and so the direction will be towards the Earth - irrespective whether one can see Mecca at a particular time or not (think on the scale of the size of the Moon from the Earth - though Earth would appear slightly bigger). For some perspective, check out this picture of Earth from Apollo 8, when it was orbiting the Moon. All said, I find this an interesting way to think about space settlements (and I'm assuming the same for you), but I don't want to sound as if I'm defending a religious perspective. It will be quite silly if people on the Moon start quibbling about prayer directions. (also see this post about praying in space). This does seem a curiously backwards tradition considering all the advances in science and mathematics pioneered by ancient muslims. I believe I heard something about how Muslim astronomers even accurately predicted the circumference of the earth... and that was over a thousand years before a multimillion-dollar satellite was possible.